I enjoyed solving this case so much that I had THREE goes at it! 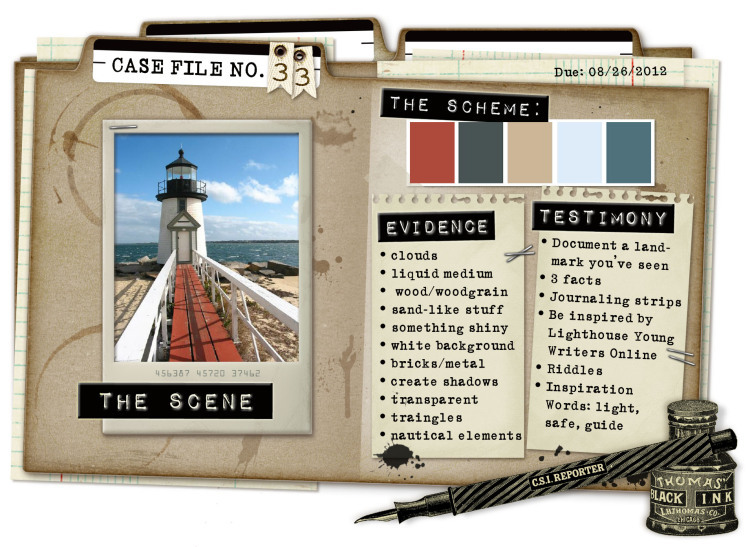 As you can see, it's all very nautical, and the CSI Coordinates - WELL! - I always love these free printables, but this is my favourite so far. 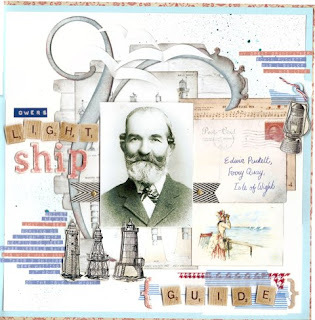 They always include some quotes, embellishments,journalling spots and background papers. Have a look on the CSI website and you will see for yourself. It would be totally possible to solve the case using only the Coordinates really, but it's nice to go "shopping" in your own stash as well. My Great Great Uncle Albert on HMS Dreadnought. 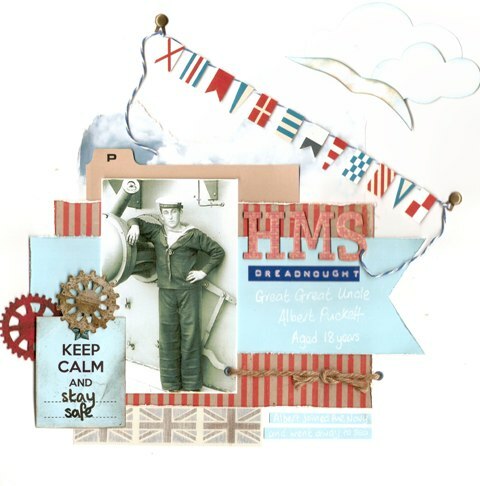 Evidence: white background; nautical elements -signal flags from Coordinates and reef knot in the string; clouds on the Coordinates paper and hand cut ones in the corner; metal - brads holding the flags. 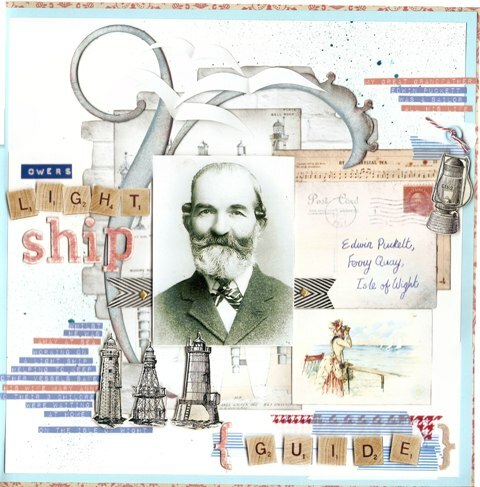 This is Albert's father, my Great Great Grandfather Edwin Puckett, who was also a sailor all his life. My Evidence: wet medium - misted background; woodgrain on the letter tiles from the Coordinates; nautical elements from the Coordinates again; metal - brads; create shadows - I tried to do this by raising the letter tiles on foam tape and making the seagulls from scrap paper. Unfortunately, the border of this page has been lost in transit - try to see in your mind's eye a quarter inch border of a rusty red wallpaper pattern type print. Can't wait to see what they come up with for next week - I SO don't have time for work!!! I don't do scrapbooks, but I appreciate the artistry and craftsmanship in your work. Blessings! Hi Arnoldo, thanks for the words of encouragement - I'm off to have a peek at yours now! 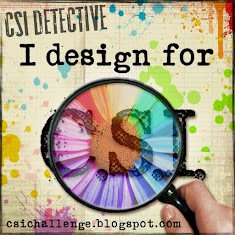 Hi Annie - thanks for nosing around my blog and leaving such a nice comment :) I'm totally digging your takes on the CSI #33 ... fabulous photos and you showcased them perfectly ... I love the banner and the cog wheels on the first and the scrabble tiles on the second are awesome! 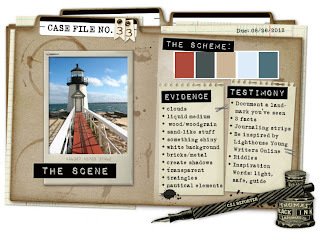 I love your art productions Annie and the CSI case file looks put together really well. You’ve managed to create a cohesive framework for all of the elements that constitute it.